March 14, 2016	| 6:00 p.m. 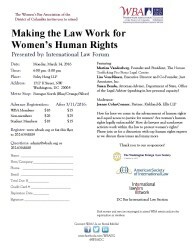 Please join the International Law Forum of the Women’s Bar Association of DC on Monday, March 14, 2016 from 6-8:00pm for a dynamic discussion regarding the progress that has been made in advancing the human rights of women. 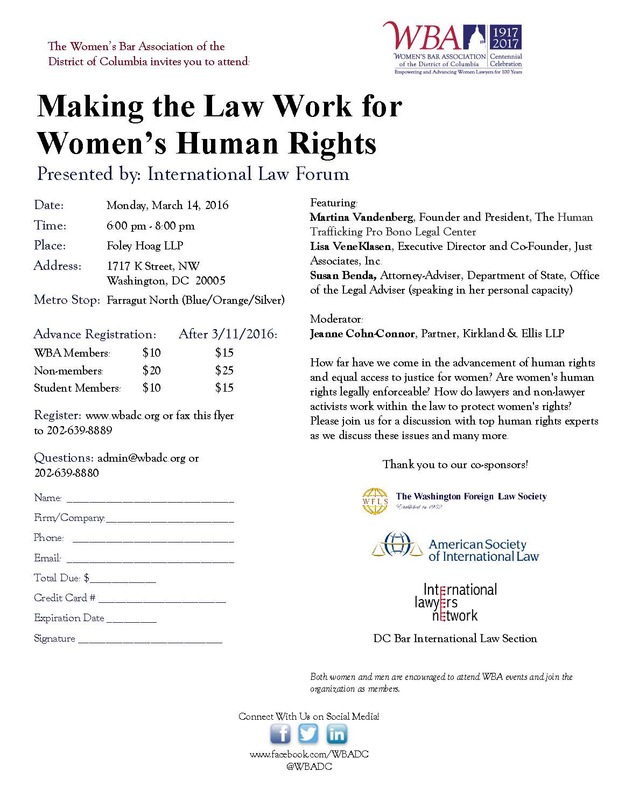 Our panel of human rights experts will discuss the legal vehicles used to enforce women’s human rights, the international framework aimed to promote and protect these rights, the ways in which lawyers and non-lawyer activists work within the law to protect women’s human rights, the accountability of foreign officials and diplomats, and much more. Register here to attend http://www.wbadc.org/calendar_day.asp?date=3/14/2016&event=1176. The details for this program are below and in the attached flyer.